Monthly passes are attainable on charlie cards with the pass printed on them, such must be ordered online or through an employer. The trouble is it is wasteful as you're getting a proximity card that is good for only one month. Charlie 2.0 is in the design and planning stages and will likely take care of this. Just as the fare gates that allow swarms of people through on a single paid fare (or pass entry) replaced turnstiles to deter such fare evasion, Charlie 2.0 will employ this era's beloved Proof of Payment system which will, with anticipated enforcement levels, translate to 2 classes of riders; Pass-holders and freeloaders. RenegadeMonster wrote: I feel like the Transit Police should have at least taken a moment to verify that the ticket is valid and if the passenger is frustrated allow them to board and remind them to get it replaced the next time they are at north station. Thanks for sharing your feelings. T Police are not Customer Service Ambassadors and if they get involved it's probably because an issue has already escalated to an unacceptable level. You don't get a waiver for being disrespectful. Again, the pass was no longer the subject of the situation by the time police got involved. sery2831 wrote: Faded passes cannot be reissued once the next month sales have started. So, does that mean they wanted him to purchase a new ticket? It didn't specify in the globe article. Just that he needed to go to the ticket counter to get a new ticket. You would assume reissued. That's not what the statement of tariffs says. 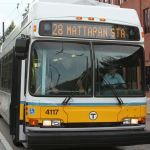 If electronic or printed fare media is unreadable by MBTA staff or MBTA fare equipment, a receipt from an MBTA Fare Vending Machine, Retail Sales Terminal, or an MBTA website must be presented in order for a replacement/exchange to be provided. Damaged CharlieCards or Tickets may be replaced at the CharlieCard store if they can be determined to be valid. Of course the ticket verifiers simply implied, according to the Globe piece, that the passenger could have shown his faded ticket to the North Station window attendant and received a new pass. So we have ticket checkers who are performing platform checks that seemingly violate the T's published fare rules, instructing passengers on procedures that may or may not actually be true. Wonderful. Also, I doubt he had his receipt on him. More than likely if he saved it it would be at home. No way he could show it that night for a replacement. All though it sounds like they could have still been able to validate the ticket just by looking at it more closely. All the more reason to take the time to say bring your receipt with you tomorrow and have your monthly pass reissued and to allow him to board rather than refuse to take a closer look at the ticket or allow him to board. The time for Monday morning quarterbacking in regards to the tresspasser's arrest has long expired. Further discussion in this thread is limited to fare gate installations and procedures leading up to such installation. There is only ONE CharlieCard store. Keolis is a retail sales location. The only people that can reissue the pass is as you quoted above. I didn't participate yesterday and speak with Keolis management yesterday at North Station as I didn't know this was going on until I arrived at North Station last night at around 5:55 to catch my 6:05 train. However, tomorrow, Thursday November 9th, this will be taking place at South Station and Back Bay from 4:00pm to 6:00pm according to the station sign at north station. The event "Meet the Keolis Managers". Keolis Management is open to dialog and feedback on service including on "The Ring of Steel". So if anyone wants to discuss this and give their input to Keolis's management here is your chance through proper channels. Fair use: "The Massachusetts Bay Transportation Authority has delayed a plan to install fare gates at commuter rail platforms that would have required riders to prove they paid for a ticket before boarding at North, South, and Back Bay stations." I've got to say this would have been useful during the parade. I heard that they stopped selling and checking tickets because the trains were so full!